Belgian champion Jens Debusschere (Lotto-Soudal) emerged from a crash-marred stage 2 of Tirreno-Adriatico to win on Thursday. Debusschere, 25, took advantage of an eager lead-out from MTN-Qhubeka to sprint to his first win of the season at the end of a flat, 153-kilometer stage from Camaiore to Cascina, Italy. “It was really hectic today. 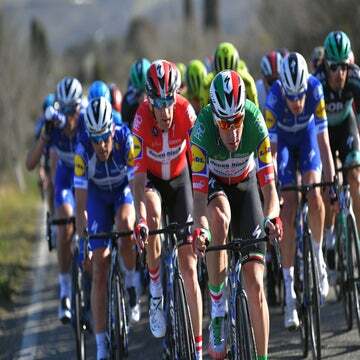 The last five kilometers, the speed went full gas up,” said the winner. “No one could make a proper lead-out. We managed to place ourselves in the Quick-Step train. And I could come out [in the sprint]. The early breakaway — Edoardo Zardini (Bardiani-CSF), Carlos Quintero (Colombia), and Cristiano Salerno (Bora-Argon 18) — was caught just after the 15km to go mark. At one point, the break had a seven-minute lead. Danilo Wyss (BMC Racing) also took part in the escape early on and netted himself the mountains classification lead with his efforts. With 11 kilometers left, a crash disrupted the peloton. Matteo Pelucchi (IAM Cycling), one of the day’s favorites, was caught up, along with Orica-GreenEdge’s Adam Yates. Inside of the final 10 kilometers, Tinkoff-Saxo looked keen to set up Peter Sagan for the sprint. MTN-Qhubeka and Astana also were a presence at the front. With two kilometers left, Zdenek Stybar (Etixx-Quick-Step) drove the pace amid several MTN-Qhubeka riders. Edvald Boasson-Hagen (MTN-Qhubeka) then led the charge into the final kilometer. 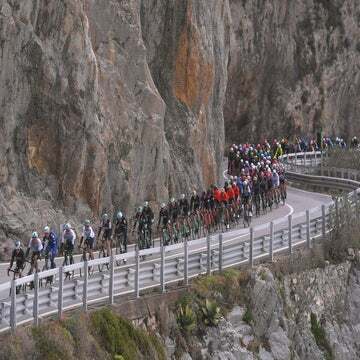 A major crash took out a line of riders in the final few hundred meters. Team Sky’s Elia Viviani ended up on the pavement, along with Sacha Modolo (Lampre-Merida). Viviani touched Mark Cavendish’s wheel, which caused a chain reaction, leaving a group of about 10 riders to contest the final sprint. Debusschere emerged from the chaos, jumping off the wheel of the final MTN rider to sprint to victory. Peter Sagan (Tinkoff-Saxo) was second and Sam Bennett (Bora-Argon 18) was third. “Today was not so easy, but we stayed out of the three crashes,” said race leader Adriano Malori (Movistar), who kept his overall lead. “It was very stressful in the group, with a lot of crosswind. With 200 riders, crashes are bound to happen. 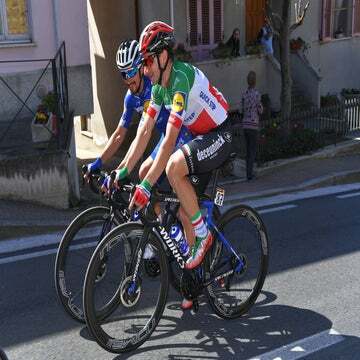 I was happy to have the jersey today, but tomorrow, Sagan, Cancellara, or Greg Van Avermaet will probably take it.” With the time bonus for second place, Sagan moved up to second overall on the same time as Malori, ahead of Fabian Cancellara (Trek Factory Racing), who is now third. Andrew Hood contributed to this report.